From our little aire at Cóbreces we headed further along the coast to Gijon past the Picos de Europa mountain range for our final overnight stop with Wayne and Felixa. From here they were heading inland to friends they had met on the road several years previously who had now bought an entire small hamlet in the hills which they were renovating. Our plan was to head to Santiago de Compestella, a place Michelle has wanted to visit for many years. The weather in Santiago was to turn cold and wet for a few days so on the way we headed towards a paid aire at Foz (Atalaia Camper Park) where we could plug in and benefit from some heat during the cold snap. Next morning we said our goodbyes and headed off in different directions. After stocking up on food and groceries at a nearby Lidl, we made tracks to Atalaia Camper Park in Foz where we were greeted by an enthusiastic owner, Moncho. He is a motorhomer himself and has built a cracking aire complete with modern toilet and shower facilities, a full laundry with washing machines, dryers and even an ironing board and iron. Moncho was closing the aire in a few days time to go travelling for the winter but he had put plans in place to have the aire fitted with a fully automated entrance system by January (see my review and pictures on searchforsites.co.uk). The town of Foz itself is within easy walking distance, but is not much to write home about. We walked into the town for our first visit to a Mercadona since we came into Spain to pick up a few items not readily available in Lidl. On the way into town we spotted this little doer upper hidden behind a block of new apartments complete with its little horeo (grain store) in need of some repair. The best bit about the location of the aire is that it is very close to a stunning beach which stretches towards the town. A long stretch of pure white sand reflecting the pale turquoise blue of the Atlantic made for one of my favourite pictures of the tour so far with Michelle standing admiring the view out to sea. On our last night in Foz we settled down to watch the movie The Way, starring Martin Sheen and our own James Nesbitt about a group of pilgrims walking the Camino de Santiago to warm us up for our visit. Next morning we made our way inland over the mountains to Santiago de Compestela. We had a choice of 2 places to stay, the park and ride car park at a cost of €15 per night with no electricity, or the sports arena car park which was free. We chose the sports arena! Having arrived in the late afternoon it was still raining so we settled in for the night ready to explore the city the next day. From our parking spot it was quite a trek to the old quarter of the city, firstly downhill through a gorge and then up a very steep hill to the old town. Just as we reached the side of the cathedral and clock tower the heavens opened once again. We made our way around to the front of the cathedral for our first view of the impressive facade under a gloomy grey sky and took shelter in the porticoes under the Ayuntamiento building opposite. The cathedral square is made up of 4 large buildings. The cathedral front itself, the government offices opposite, on one side is part of the old university and on the other a Parador luxury hotel. After taking a few snaps of the cathedral the rain started to ease after about 30 minutes and the sky started to turn blue. The cathedral has been undergoing major refurbishments for many years but the scaffolding has now been removed from the facade revealing it in all its glory. The cathedral is the supposed resting place of the remains of St James and statues of him adorn the front of the cathedral and on the top of the government building astride his horse. St James on the government building…..
St James was a pilgrim himself and this is the reason so many pilgrimages converge here from the different routes of the Camino de Santiago. 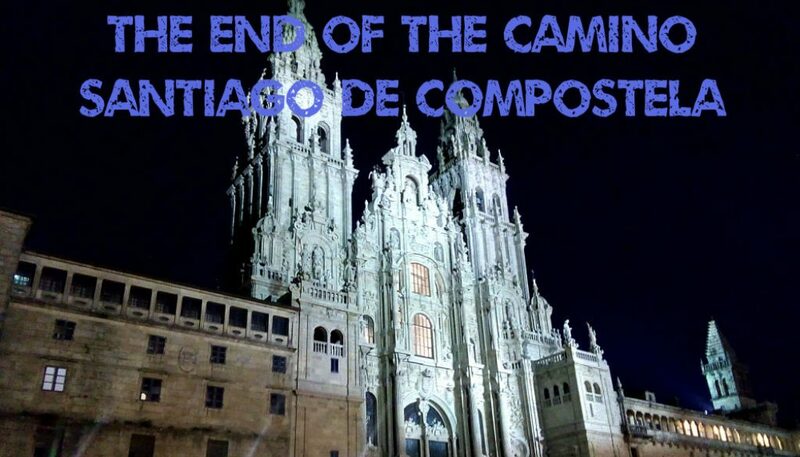 Pilgrims must walk a minimum of 100km on one of the various routes, collecting stamps in their pilgrims booklet along the way to finally arrive in Santiago and receive their Camino certificate. Even late on in the year, many pilgrims gather in the square each day delighted at their personal achievement. Many also write messages on the large cobblestones of the square. After a little research whilst waiting for the rain to stop, we were amazed to find out that entrance to the cathedral is free. Perhaps it is temporary because they are still renovating the inside at the main entrance, the Portico of Glory and also behind the main altar. We don’t like to pay into religious buildings, and even the small church of Santillana del Mar wanted an entrance fee of €6, so we were amazed that one of the most significant religious buildings in Spain was free of charge. During the rain we could also hear the sounds of Galician bagpipes playing and when the rain had stopped we spotted the piper standing in the shelter of an archway at the far side of the cathedral. We made our way around the rear of the cathedral to the other side at the clock tower which is where you enter. As long as you are not carrying a pilgrim backpack or staff, you can enter. Pilgrims can leave their backpacks free of charge at the Pilgrim’s office about 200m away. Once inside the cathedral, they were busy setting up the huge nativity scene. Once you pass around it one of the main attractions of the cathedral comes into view. The Botafumeiro is a huge silver incense burner weighing 53kg which is suspended from the main dome by pulleys. It is filled with frankincense and swung by eight priests by a series of ropes from side to side through the naves. We have seen many videos of this in action including in the movie The Way, and it is an impressive sight. In the centre of the gold facade around the main altar is yet another statue of St James. Pilgrims and worshipers queue up to climb the steps behind the statue and hug it from behind. Spookily in my picture of this you can see a face just above his shoulder on the left. Another statue of St James on a white horse inside the cathedral. If you come from Northern Ireland a man on a white horse, especially if adorned with orange lilies, represents someone totally different, known locally as King Billy 🙂 . The swinging of the Botafumeiro during mass is now a bit of a lottery, but many sources suggested that it would be swung at the Pilgrim’s mass at 7.30pm on a Friday, so being a Friday Michelle was keen to attend the mass in the hope of seeing it swinging. We stayed in the city and went to a small bar for a menu del diá, which at €10 each including a drink was great value. Whilst in the bar we noticed a man we had seen outside singing earlier – a traditional Galician folk singer. He approached us and when he heard we were from Ireland he showed us some of his Ireland patches sewn on to his long black cape. He had been all around the world performing his music collecting badges from the different countries. He sat down beside us and started to serenade us. A lovely end to the meal. By now the sun was starting do go down giving a beautiful glow to the cathedral and old city. At 6.30pm, although neither catholic or even religious, we headed back into the Cathedral to secure a seat for the pilgrim’s mass which started at 7.30pm. Catholic services are a bit of an enigma to us and we felt a bit lost during the multiple standing up and sitting down and congregational responses. Needless to say the service ended without the Botafumeiro being put into action. Behind us we had heard two German tourists who were as equally bemused and disappointed with it all when the service ended. Slightly disappointed we headed back to the van to find out that the Botafumeiro had been swung the previous Saturday and would be swung again at the mass the following week for the Feast of the Immaculate Conception. Yet again our timings were slightly out! With our visit to Santiago over it was time to make tracks towards the border into northern Portugal.